Super flat Vacuum Chuck (V-Chuck) features 1Um surfaces (100nm in localized areas) with ultra-low particulation and minimal surface contact. 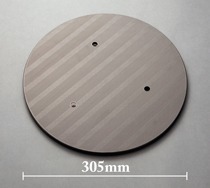 DLC-coating on alumina surface (KP-95, KP-990) can be available. Vacuum chucks can support a surface smooth finish to the nano-level according to machining systems. Overall mapping data can also be measured. Vacuum chucks of up to 18 inches are available.